Using found imagery is definitely not a new idea, but it sure is a good one! 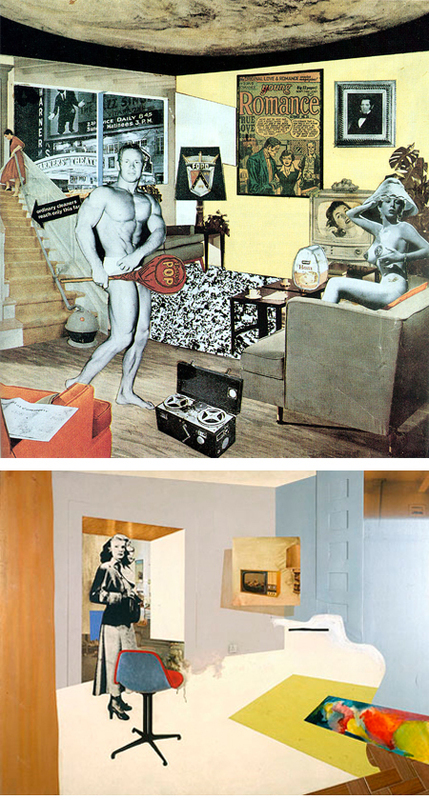 For example, one of the most famous pieces from the Pop Art era is Richard Hamilton’s ‘Just what is it that makes today’s homes so different, so appealing?’, 1956 (shown below). Even Picasso used found imagery during his cubism period. I totally admire the creativity that’s required to give an existing image an entirely new context. And as easy as it seems… a little snip here, a little glue there… it’s quite a task to create something new and fresh from images/ideas that are already very established in their meaning. All of the artists in this show have taken previously used images and repurposed them ~ some make political statements, some comment on society, and others just tell a really good story. I would love to actually hang this show, and if I had the clout of say, Sheena Wagstaff, Chief Curator of the Tate Modern, I’d be able to acquire the appropriate work from various galleries/private collections all over the world. Luckily for me, this is a Jealous Curator show, and absolutely no clout is required to put a show together. I’m including work by a few contemporary artists, but I also dove into the art history books and am featuring some very famous pieces by a few very famous artists… because I can. thanks stephanie – i’m going there right now…. I love this post and thank you several artists I have not heard of yet. And people give me crap for doing this kind of thing in my art journal. You never know one day after I’m dead and someone finds my work maybe I’ll be on a blog! Please. Sign me up for the blog!